(1) all cardstock colors including in-colors; (2) All punches (that you can make any size you want); (3) 4 different designer kits: Christmas; sunny day, Summer and birthday and all of the components that come in those kits, such as die cuts and borders; (4) buttons (not designer buttons); (5) circle brads in most colors; (6) eyelets; (7) stitching and staples; (8) grosgrain ribbon plain - no polkadots or stripes; (9) I don't know the exact number of stamp sets but I would say there are probably 30 sets available to use; (10) you can add video and/or music to your pages; (11) availability to make just about any size scrapbook page, cards, calendars and other multi media projects, such as posters. 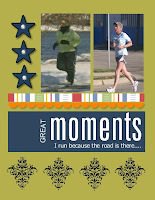 The only thing I've had time to learn is the scrapbooking and then I created a card, but I can't show it to you yet because I have to give it to Chris for her birthday since I am unable to stand for any length of time in my craft room just yet. So I'll try to post it next week; (12) background papers, quite a few, but I didn't see any designer papers, other than those in the scrapbook kits. And I'm sure there are a lot more things that I haven't even discovered yet. I went online to see if there were any digital downloads available to purchase yet and there are not. I'll keep you posted if anyone is interested in this. I would love to hold a class and teach you the versatility this program has, so if you are interested in purchasing the software, please click on the link on the right or contact me. 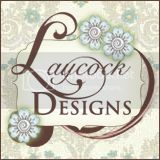 Also any fonts you have loaded onto you own computer you can use on your pages and any other digital elements you may have purchased from another designer can also be used. You do need quite a bit of space on your computer for it to run quicker. I downloaded the program to a new external hard drive I purchased about a month ago and I work off of that, so that helps but I also realized that you need a DVD player on your computer and we have an older computer so I only had a CD player. The good news again is that you can pick up an external DVD player for about $50. An option I could have had here was to take my CD to someone's house and my external harddrive and download it without the additional purchase of a DVD player, but ironically, we received a DVD from Peter's sister in the mail all about the Schweitzers and if we didn't have the DVD player, we wouldn't have been able to view it. So if you don't have one, it may be worth the investment to go out and get one. The external harddrive rocks. It is 1 terabite and I got it online for $100 thru Amazon. It's small, it's sleek and I feel like I have my own personal harddrive that I can put my photos and digital elements on and not have to worry about it crashing. If my main computer crashes, my hard drive does not - interesting hey. 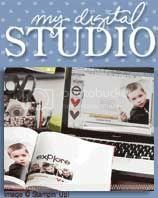 So I've gone on long enough, I'd love to hear your thoughts about My Digital Studio from Stampin' Up. Is it something you would consider purchasing or is this something that you would never consider. 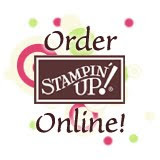 We at Stampin' Up like to call it a Digital Paper Crafting Solution. this is just a test to make sure my "comment" section is up and running because I've gotten a ton of hits but no comments. Hmmmmmm.